Anthem Foundation, the philanthropic arm of Anthem Inc., has named New York Yankee, World Series Champion, and founder of the PitCCh In Foundation CC Sabathia as the latest recipient of the Anthem Health Champion award, which raises awareness about critical health issues and recognizes individuals who are making a difference as healthy role models, and inspiring others to do the same. Sabathia was honored for his commitment to empower youth with the tools to be successful in leading healthy, physically active lives. "At Anthem we are committed to creating a better healthcare experience for all including the communities where we live and work," said Peter Haytaian, executive vice president and president, commercial and specialty business at Anthem. 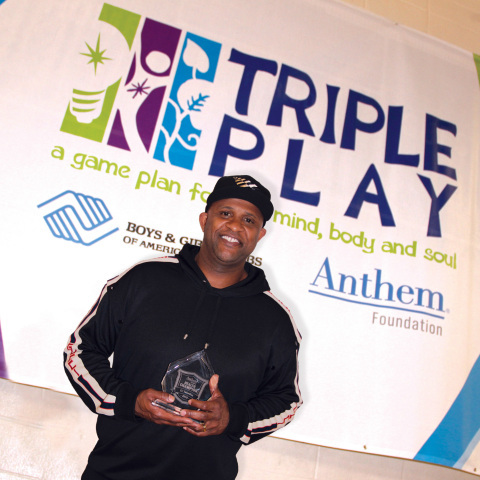 "The Anthem Health Champion Award provides us the opportunity to recognize individuals who share our values and we are pleased to recognize CC Sabathia for his work to bring sports and physical activity opportunities to children across the country." In 2008 Sabathia and his wife Ambr established the PitCCh In Foundation to help raise the self-esteem of inner city kids in need through community outreach, sports and educational programs. Through the various programs, more than 1,500 kids have participated in All Star Baseball Clinics, over $800,000 has been invested in athletic and community renovations to create safe playing environments and approximately $3.9M worth of school supplies and backpacks have been provided to ensure elementary school children have the items they need to be successful in their education. Sabathia received the Anthem Health Champion award before a crowd of more than 200 kids, nonprofit and community leaders at the Boys & Girls Clubs of America's Triple Play (News - Alert) Day event in New York City, sponsored by the Anthem Foundation. As a Boys & Girls Club alum, CC Sabathia expressed his passion for motivating the next generation of kids to prioritize health and wellness in their lives. "Growing up, my Boys & Girls Club helped me find my passion for sports and learning. Today, it's incredibly important to me to motivate the next generation of young people to be active and healthy so they can achieve anything they want to as adults," said Sabathia. The Anthem Foundation is the philanthropic arm of Anthem, Inc. and through charitable contributions and programs, the Foundation promotes the inherent commitment of Anthem, Inc. to enhance the health and well-being of individuals and families in communities that Anthem, Inc. and its affiliated health plans serve. The Foundation focuses its funding on strategic initiatives that address and provide innovative solutions to health care challenges, as well as promoting the Healthy Generations Program, a multi-generational initiative that targets specific disease states and medical conditions. These disease states and medical conditions include: prenatal care in the first trimester, low birth weight babies, cardiac morbidity rates, long term activities that decrease obesity and increase physical activity, diabetes prevalence in adult populations, adult pneumococcal and influenza vaccinations and smoking cessation. The Foundation also coordinates the company's year-round Associate Giving program which provides a 50 percent match of associates' pledges, as well as its Volunteer Time Off and Dollars for Doers community service programs. To learn more about the Anthem Foundation, please visit http://www.anthem.foundation and its blog at https://medium.com/anthemfoundation.